In 1879, Burton Corporation was considering the possibility of operating horse drawn omnibuses/trams within the borough. It dismissed applications for other proposals and finally decided to implement its own tramway system in 1903. 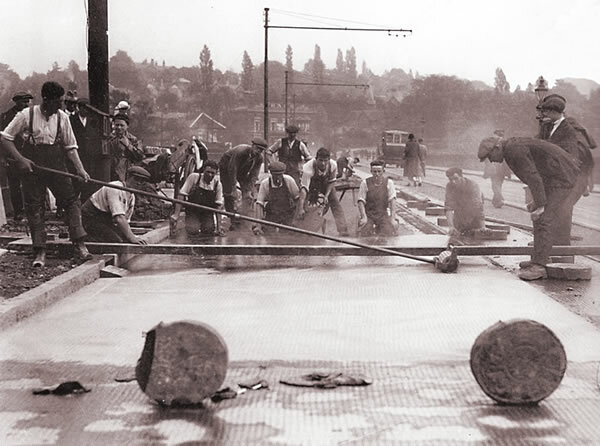 A total of eight and a half miles of track and overhead electic cables were laid in readiness for the initial tramway. The work shown below in Station Street, close to the High Street junction, gives an idea of the levels of workforce employed. 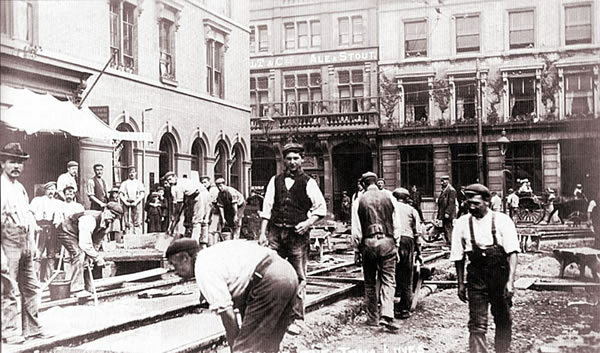 Around the corner in High Street, the track laying continued. Most of the buildings are still recognisable today. 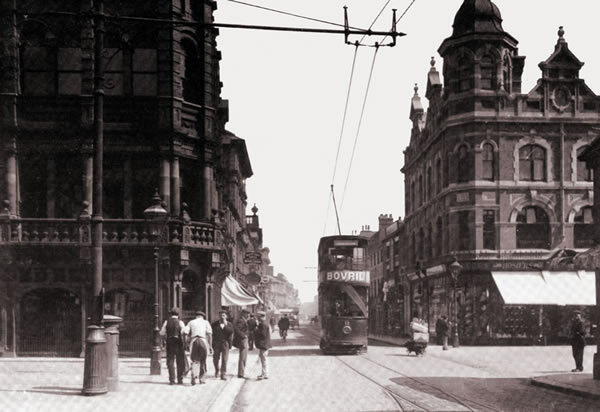 At the time, the building on the left was Hallam’s the chemist. Also visible is the relatively new Ordish and Hall building. Not terribly good quality but just too nice to exclude is the below photograph taken at the very bottom of High Bank Road in Winshill. Aside from the horse-drawn mobile inspection tower, the scene is very recognisable. Given the small assembled crowd, the taking of the photo seems to have been something of an event! The single track across the Trent Bridge, requiring careful timetabling, was laid to one side in anticipation that the bridge would be widened with a new track on the ‘other’ side. 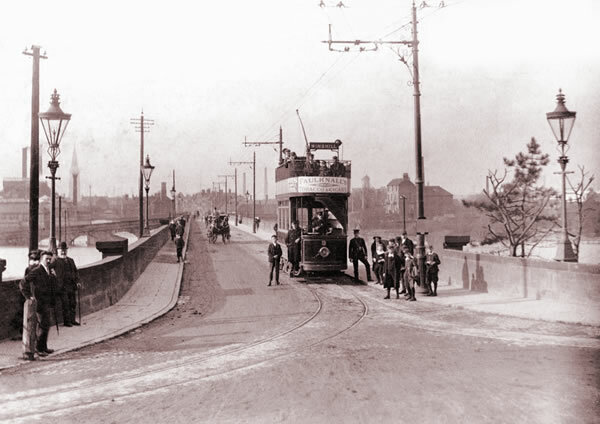 Burton’s new Tramway was finally launched to great excitement on Bank Holiday Monday, August 3rd, 1903. Huge crowds assembled in King Edward Place, in front of the Town Hall, and all the way down Station Street. Much bunting was in evidence and six new tramcars, from an initial fleet of 20, were themselves highly decorated for the occasion. The Mayor, A.J. 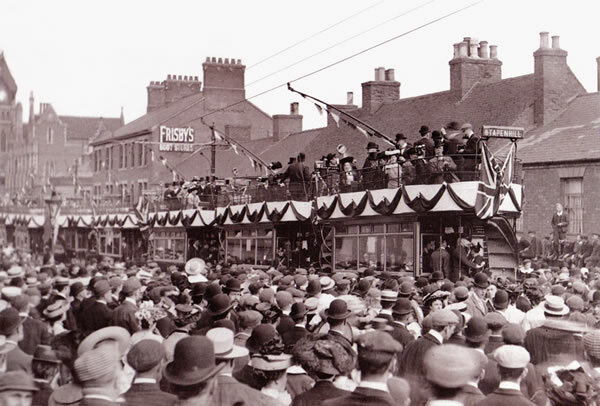 Roberts, Mayoress and members of the Burton Borough Council rode on the first tramcar which went to Stapenhill. 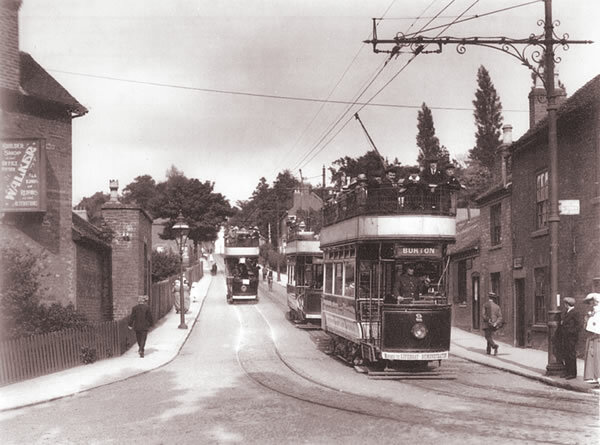 The second car went up Bearwood hill to Saint Mark’s church in Winshill; the third to Branston, the fourth to Horninglow along Waterloo Street, Victoria Cresent and Horninglow Road as far as Saint John’s Church. The final two again went to Stapenhill and Winshill. Many hundreds of Burtonians lucky enough to gain places took advantage of fare free rides to commemorate the opening day. The initial fleet consisted of 20 ERTCW appropriately numbered 1 to 20. Although these were open-topped, it wasn’t long before the disadvantage of this was realised and most were converted to covered top. Aside from four additional cars being purchased after the First World War in 1919, these comprised the entire Burton Corporation fleet until its final closure in 1929 after 26 years of operation. The depot was situated in Horninglow Road. Some years later, the ‘new’ police station and magistrate’s court was built next to it. 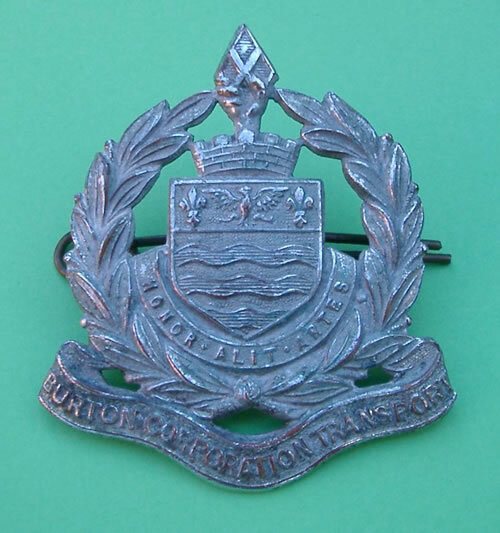 Tramway workers proudly sported the new Burton Corporation Transport badge. 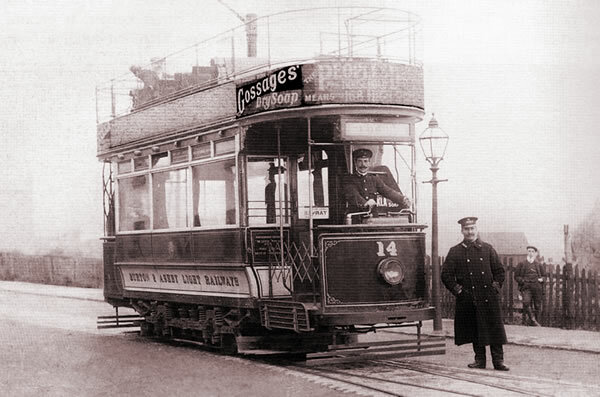 As well as the Burton Corporation system, the Burton and Ashby Light Railways, owned by the Midland Railway Company, operated a tramway system to service its railway stations at Gresley, Ashby-de-la-Zouch and Burton-upon-Trent running through Bretby, Newhall and Swadlincote in South Derbyshire. It had been agreed that these trams would pay to use Burton Corporation track. It had its own terminus in Wellington Street. This fleet was also 20 open-topped double-deckers. The Midland Railway Company became part of the larger London, Midland & Scottish Railway in 1923. 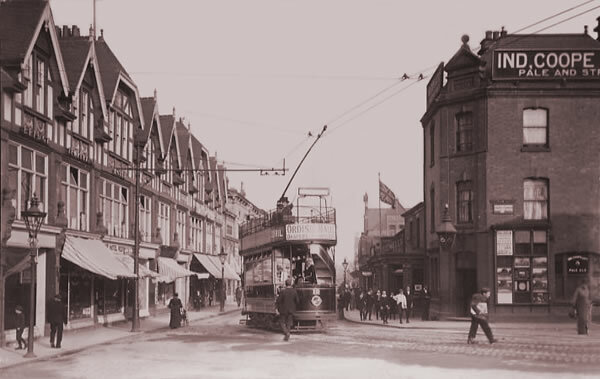 Due to the losing battle against much more flexible routed buses, they closed their Burton tramway operations 1927 leaving just the Burton Corporation trams. 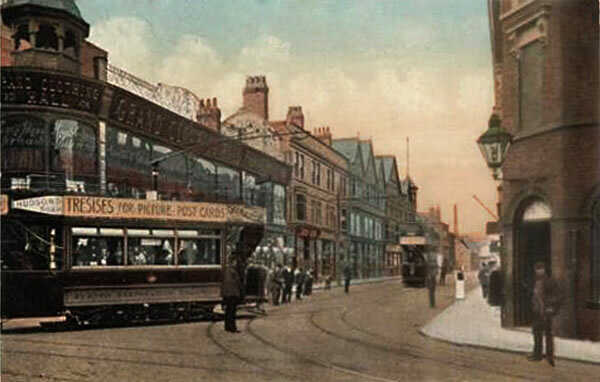 Travelling on the upper deck at such breakneck speed was a little too scary a prospect for some passengers, but the trams soon became part of everyday life in Burton and simply taken for granted. The one below traversing High Street can be seen to have had a roof section fitted. 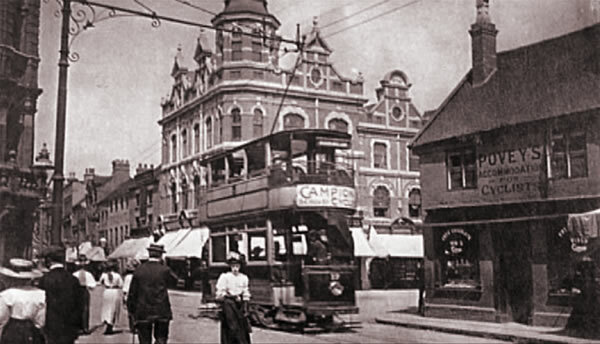 And the below 1906 tram, with the still very recognisable building at the corner of the market place. Also showing one of the numerous buildings that disappeared to make way for the Abbey Arcade – Povey’s tea room proudly offered accommodation for cyclists. Coincidentally, the tram carries an advert for Campion Cycles, the best known cycle shop in town at the time. 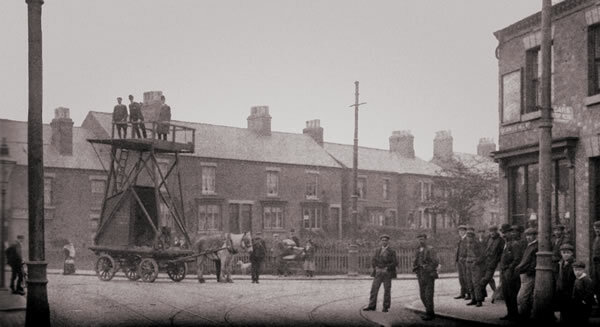 The below photo taken in Station Street, at the foot of the Station Bridge, became one of the most popular postcards of Burton soon after the tramway system was opened. 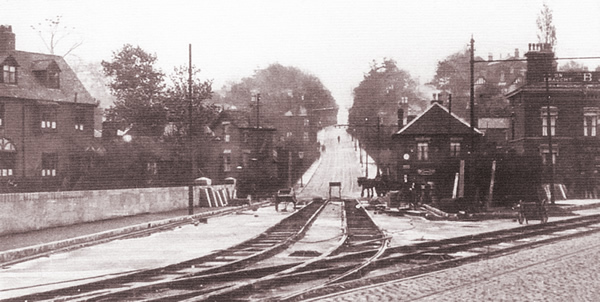 The next scene below, at the bottom of Bearwood Hill would have been extraordinarily busy with two trams coming down and one making its way up. Particularly since the unwidened Trent Bridge was still single track. A closer inspection shows that the foremost tram, No. 2, is in fact part of a ‘Remember the lifeboat’ demonstration. No account of the Burton Tramway System would be complete without mention of its most famous accident. On 8th October 1919, tram No. 19 ran out of control down Bearwood Hill in Winshill. 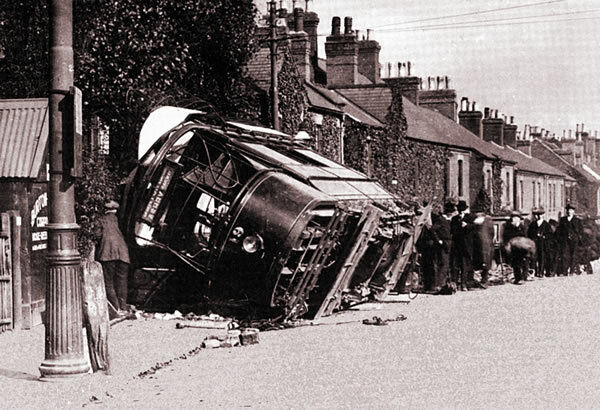 It careered across Newton Road and turned over killing the conductress, Lilian Parker, and a passenger. Sixteen other terrified passengers were also injured. The Fire Brigade managed to right the tram. 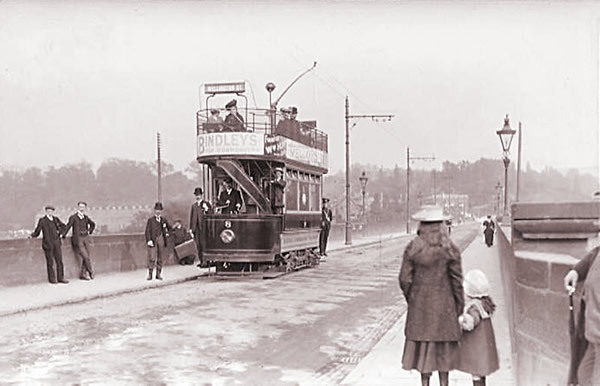 Following the incident, the whole area was redesigned to provide trams with straighter access to the Trent Bridge. Though a little too early for colour photography, a few colourised images were produced for the purpose of postcards. Although primitive by today’s standard, these cards provide some valuable information. This example confirms the Burton Corporation cream and burgundy livery. 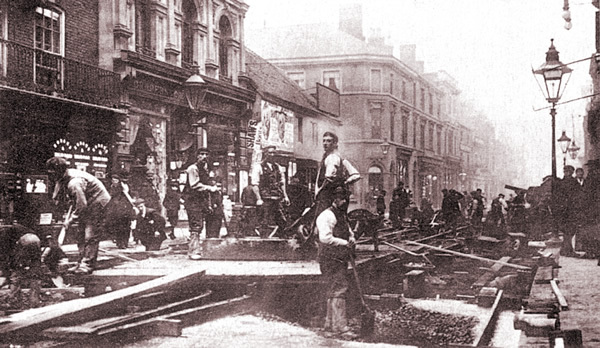 The tops of the buildings in Station Street remain pretty much unchanged to this day but this image provides an excellent reminder of the two High Street corners before they were re-developed. The final Burton tram ran on the 31st December 1929 to much celebration. 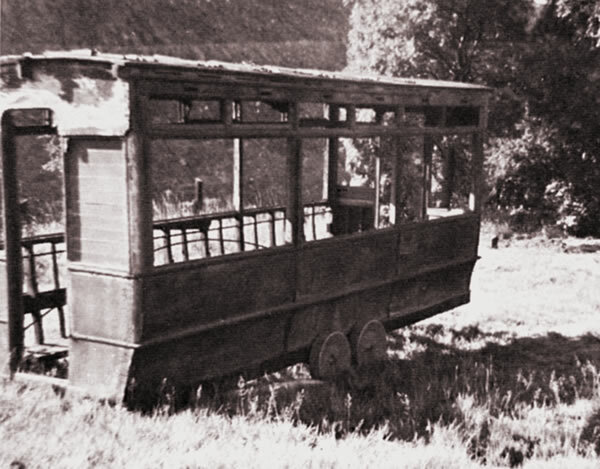 After the closure of the system, many of the tram bodies were dismantled and offered for sale by Burton Corporation with the claim that they would make ideal garden sheds or outbuildings! I live in hope that I can find an example of one put to such use in Burton so that it can be featured here. That should really be the end of the story – except there is still the remarkable continuation of Tram 14 of the Burton & Ashby Light Railway. Although not a Burton Corporation tram, it is too good a tale to miss out. The tram can be seen in service above with driver, Charles Wells, standing by and letting conductor, Len James enjoy a feel at the controls. A passenger is happy to bide his time on the top deck. As with many trams, as previously covered, it was sold of the provide a cheap alternative to a garden shed or pavillion. Discovering some decades later in the above condition, and having also located two other similar, but even poorer condition, tram cars, a small group of enthusiasts decided to try and restore it to its former glory. Though making good progress, the project eventually came to a halt after becoming too costly and beyond the resources of the group which had by now been reduced to just four members. After numerous failed attempts to gain support from either local organisations or transport museums, it was seriously considered to burn it for glory at a firework display! The born lucky tram got a last minute reprieve when an article by J.H. Price in ‘Tramway World’ caught the eye of John Woodman of ‘Blackpool Trolleycar Limited’ based in New York State, USA. He had previously succeeded in restoring a Blackpool Tram and getting it running in the city of Philadelphia. The final destination this time was to be Detroit. 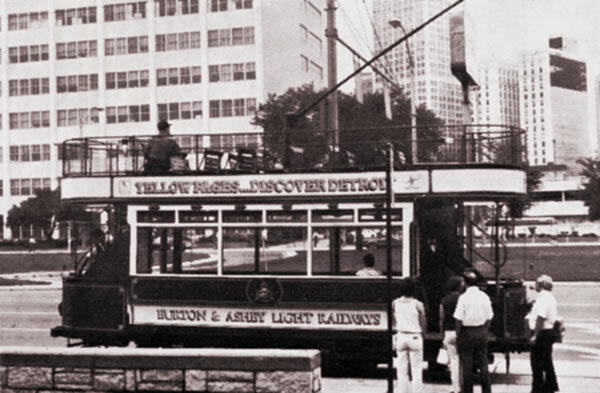 The final stages of the project was sponsored by Michigan Bell Telephones Yellow Pages, whose name appeared on the livery. The work was completed by a number of local companies. The full fascinating story of the restoration and shipment to Detroit where it was once again put into proud service can be read in ‘Sixpenny Switchback’ by P.M. White and J.W. Storer (1983); a lovely book which provides the complete history of the Burton & Ashby Light Railway.